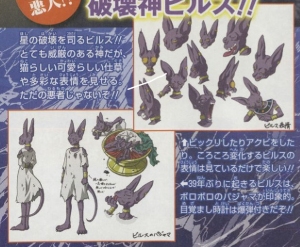 Thanks to the latest edition of V-Jump in Japan we have a whole new look on Birusu and his many expressions. In the picture he almost looks like he is wearing a lab coat but it looks like what he wears to sleep for decades. Along the side of that it looks like a drawing aid for the artists to capture the many face expressions of Birusu in the movie. From all the characters in DBZ his face changes a lot from picture to picture which may be due to us seeing it from many different sources from the poster to games and the trailers.